One of our best selling inexpensive flower girl baskets! A simple round basket is sometimes all you want and need to accent your flower girl's walk down the aisle. This flower girl basket is just the thing for brides who don't want overly ornate or frilly accessories at the ceremony and reception. Measuring 7" tall, this round flower basket is covered in ivory satin and accented with satin bows at each side of the handle. It is ideal for the little lady to walk down the aisle with. Fill it with rose petals that are either real or faux, or use soap petals. Also available in pure white (item FB405-W). 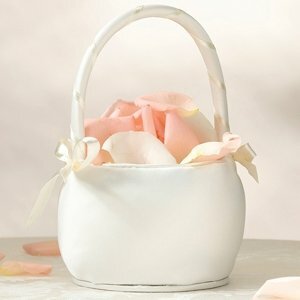 This is the ideal basket for you to gift to your little flower girl. She will treasure it always and remember her special part in your day.